The milky white color cenotaph built in the memory of Maharaja Jaswant Singh II sits above a small Lake near Meharangarh is a welcoming and peaceful spot after the hubbub of the city. Built in the year 1899, the Jaswant Thada has beautifully carved intricate lattice screens and also showcases the portraits of Rathore rulers. The Jaswant Thada was built by Maharaja Sardar Singh in memory of his father and this place is the burial ground of all the Marwar royal family. The place is built by thinly carved marble sheets that emit a hazy golden glow of the sun and one feels under a trance when catching sight of this beautiful mausoleum. The place also houses a Lake which was used for funeral rituals of the deceased and also has ducks swimming in it. The entire building is built in the traditional Rajasthani style, but some places portrays Mughal architectural design too. Meharangarh Fort, Toorji’s Step wall and Chauhan’s Art gallery. 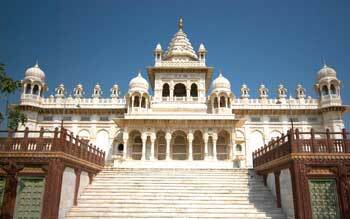 By train : The Jodhpur railway station has the nearest train facility from Jaswant Thada. By road : Jodhpur is easily connected by road to all other major cities and bus and taxi services can be hired easily to reach Jaswant Thada.